Deaf dog: Scabers Reguard Miss Patches is an 8 week old Great Dane. She is the most loving dog I have ever had, she has to sleep with mom (me) and I cant get out of her sight with out her crying, I take her everywhere with me... I would like to train her to be a therapy dog for sick or elderly people. She also loves to lay and watch TV with my daughters. 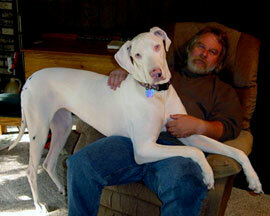 Deaf dog: Aspen(17 month-old Great Dane) is the most lovable and friendly dog I know. She has a "goofy" personality and loves to run. We have her hearing sister and a 16 year old mixed dog that she plays with. She understands body language and several hand signs, as well as obedience signs. She has been a tiny bit more difficult to train, but so loving that it more than makes up for it! Other pets: Willow, her hearing sister. Shyla the 16 yr. old matron. Mandy a 19 yr old cat. Oscar, and young cat and Chamois, and young cat.